Gifted people range from being somewhat to extremely intense and complex: intellectually, creatively, emotionally, or some combination of these factors. Their intensity can be exhilarating and sometimes highly challenging, both for themselves and for their social entourage. 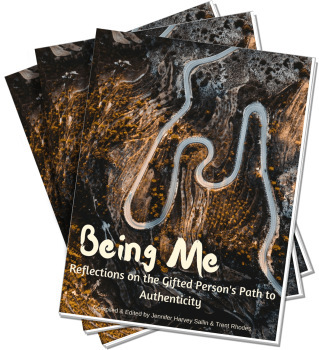 Learn more about what giftedness looks like in real life in the article below. The following categories were called “overexcitabilities” by Kazimierz Dabrowski. A gifted person typically has an uncommonly high intellectual intensity and perhaps, but not necessarily, varying combinations of the other areas as well. Dabrowski felt these areas of "uncommon intensity" - particularly intellectual, emotional, and imaginational - play a part in a gifted person's desire for advanced personal development and did not equate them with giftedness. In my work, I have borrowed his categories to represent "areas of intelligence". Like Howard Gardner's Theory of Multiple Intellgences, or other more holistic-based view of giftedness, these categories help us factor in creative, emotional and other forms of intelligence to provide a wider understanding of how various versions of giftedness manifest themselves. Looked at this way, you'd have to have a significant presence of the "intellectual" area to traditionally be considered gifted, and the other areas may act as "flavors" or nuances of your gifted mind. This is why some gifted people love studying math, others love studying people, and others love creating - and still others love all three and more. How any of the other areas of intelligence combine (or don't combine) with your intellectual intelligence shows in your own unique cognitive and relational profile. In our qualitative gifted assessments, we help you look at and make sense of your own unique profile. We also help you look at your level of giftedness and how that impacts your giftedness expression. Profound curiosity, love of knowledge and learning, love of problem solving, probing questions, search for truth, understanding, knowledge, and discovery, keen observation, reflective thought, introspection, avid reading, sustained intellectual effort, love of theory and analysis, and independent thinking. Depth and intensity of emotional feelings and relational attachments, wide range of complex emotions, strong memory for feelings, high concern for others, heightened sense of right, wrong, injustice and hypocrisy, empathy, responsibility, and self-examination. Tendency toward feelings of guilt, anxiety, loneliness, depression and somatic expression of emotions. Detailed visualization, vivid dreams, love of fantasy, creativity, inventions, love of music and art, good sense of humor, preference for the unusual and unique, fear of the unknown. Enhanced sensory experience of visual, auditory, olfactory, gustatory, or tactile stimulus. Appreciation of beauty, need for desire or comfort. Sensual expression of emotional tension (i.e. overeating). Physical expression of emotions. Surplus of energy, such as intense physical activity, competitiveness, rapid speech, restlessness, nervous habits and tics, and impulsiveness. Preference for fast action. For a lot of people, traditional roles, rules and expectations feel good, and create a sense of safety. Many (if not all) gifted people don’t feel this way! Rather, without the room to try out different roles, to stretch and question the rules, and be creative and go beyond traditional expectations and limits, gifted people often feel uncomfortable, misunderstood, imprisoned, suffocated, and at the extreme, even existentially panicked. For this reason, fitting in and finding one’s place socially is a challenge. It is said that gifted people represent a small minority of the overall population (opinions differ, but research suggests somewhere below 10%). This isn’t a statistic to make anyone feel superior, just a simple acceptance that having a “gifted mind” probably doesn’t help a person to feel socially “normal” or well-understood. But a lot of people who are gifted don’t know it, and some people don’t even want to believe it when they learn of it. They know they feel somewhat unusual, but they insist, “I’m nothing special!” This, in some ways, is true. For all of us, gifted or otherwise, what happens inside our own minds feels “normal” to us, so being described as “different” or “special” doesn’t seem accurate. However, having this attitude is only half helpful. While it’s healthy not to see oneself as “special” and therefore “superior”, it is not healthy to refuse to recognize that the way one’s mind works and one’s level of intensity are different as compared to the norm. Those who are more intense than the norm (but refuse to believe it) risk looking for intensity and complexity in friendships, relationships, discussions and collaborations when it is simply not there; then they risk being disillusioned, and blaming themselves or others for the “failure”. They also risk overwhelming less intense people with their intensity, and once again blaming themselves or others (“I must be crazy!” or “Why don’t they understand?”). It is a numbers game, in a way. If an intense person is around other intense people, he will likely feel more “normal” because those around him are intense like he is. He will be more easily understood, more easily find room to express his authentic thoughts and emotions, and feel safer to explore, expand, create and relate. And this will help him channel his intensity in a positive way. That is the goal of InterGifted – helping this become a better statistical reality for gifted people. Connecting with other gifted people, however, doesn’t mean a gifted person cannot or should not interact with non-gifted people or find a healthy way to communicate “across the divide” (though the proverbial “divide” does not suggest that one “side” is better than the other; both ways of functioning and reasoning have their benefits and limitations, and in reality it is actually less linear than that.) The essential point is: the better you understand your own mind and functioning, the better you can communicate with anyone – gifted or not – even with yourself! The safer and more understood you feel – which is what InterGifted provides in connecting gifted people with each other – the better you are able to understand yourself, and the better you can communicate. It’s a positive virtuous cycle. Academically and professionally speaking, gifted people don’t usually follow the beaten path. By the time they are adults, gifted people have often studied (formally and/or self-directed) many divergent subjects, have frequently changed jobs (once the challenge of learning a role turns to routine, they feel bored and under-engaged). They may have already had three careers at the age of 30, or may have never really settled down to do one career. Or did settle down, and feel like they have sold out and are struggling. For gifted kids and adults alike, behavioral and relational issues abound due to this difference from the norm. The issue is that gifted people like challenge, not routine. They are highly motivated by learning, creating and making a meaningful difference. Traditional goals such as approval, security, money, recognition and fame then take on a secondary importance. If a gifted person is unaware of his authentic professional needs and tries to follow traditional academic or professional goals and routines, he risks a crisis; he may exhaust his teachers, classmates, co-workers, bosses, and even family and friends with his chronic dissatisfaction and need for challenge and stimulation; he may be bullied regarding his extreme empathy, extreme sense of justice (and injustice), his inability to “go with the flow” or just accept things the way they are, problems and all; or even, being aware of all of the potential ways he could help (being empathic, creative and determined), he might become a sort of “savior” and lose himself (for a while) in cleaning up other people’s messes (sometimes which the other people didn’t even want cleaned, and sometimes to his own detriment). Meantime, his “great potential” is waiting in the wings. But since even gifted people often confuse “giftedness” with “genius”, they often protest, “I’m no genius!”, imagining that "gifted geniuses” have it easy professionally. Gifted people are the ones going to college at age ten, winning the Nobel prizes and playing virtuoso concerts, right? Sometimes, but not necessarily. Gifted people might be “genius” in some ways at certain times (certain aspects of learning are easier for them than for the average), but everyone – including gifted people – must systematically experiment and apply their knowledge over time to succeed, and must have the social and financial support to progress toward their authentic potential. Thus, giftedness does not result in automatic success; as with everyone and everything, the conditions (inner and outer) must be right for flourishing. In truth, “giftedness” is a kind of mind construction pattern (neurologically, cognitively and phenomenologically speaking) which results in a complexity and intensity of thought (and often emotion) that is uncommon. When that complexity and intensity is supported and managed well, and has the proper social mirroring, gifted people of all ages can do great things. When it is not managed well and not supported (which given the numbers, is understandable), that same complex thinking and intensity can result in underperformance and failure throughout life. Finding the right support can be a challenge, due to the “intensity mismatch” gifted people sometimes experience when reaching out socially, professionally, and for help and support. InterGifted is aimed to help gifted people find the right “intensity match” on all levels – social, academic, professional, and personal – and for all ages. Just like anything, giftedness can be a blessing and a great catalyst, and an equally great obstacle. If you are gifted or you are parenting gifted kids, the InterGifted Community offers you the opportunity to create conditions for channeling your or your kids' complexity and intensity in great ways, to form meaningful friendships with your gifted peers, and to make a positive difference in your own life, the lives of others, and by extension, the world. Come join us!